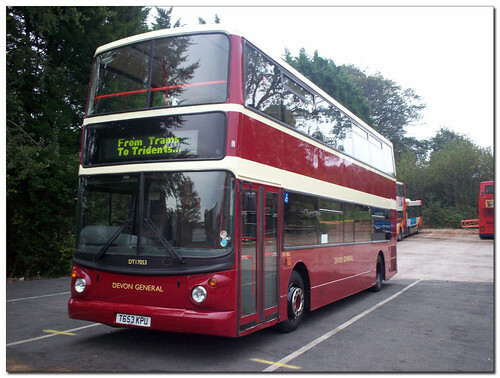 Thanks to Brian I am able to bring a decent photo of Devon General DT17053 T653KPU. It has been painted into this livery to celebrate 100 years since the trams started in Torbay. A superb job has been done on this, the Trident suiting the livery very well. More photos of this bus on Brians Fotopic site. Yeah, Interestingly that bus was once dual door and had worked in Cambridge on P&R duties along with about 30 others, which had originally come from East London. Looks very nice indeed and I can't wait to photograph it in service. Thanks to the Stagecoach Devon management for allowing us to see what a Trident would look like in DG colours. Yes it's always interesting to see how modern buses look in the old colours of our favourite operators and this Trident looks really good.I was in Exeter during August and I was surprised to see how many double-deckers could be seen in the city, and very nice it was too. I noted that Stagecoach still operate some old buses down here and I was surprised to see some former Southdown F-Reg Volvo/NC Citybuses hard at work.